Last night, I took our kindergartener to see Charmaine Clamor perform at the Dirty Dog Jazz Café in Grosse Pointe Farms and of course, we both loved it. 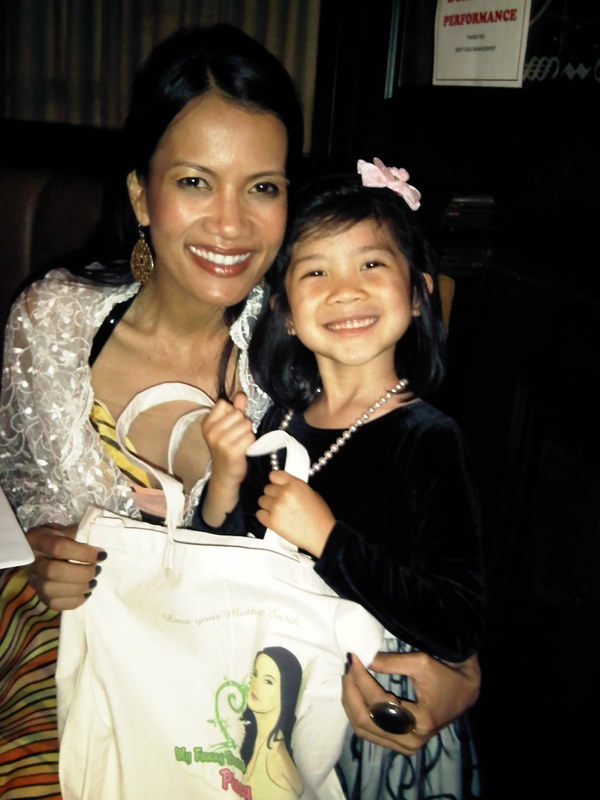 The 5 ½ year old loves to sing and is proud of being a “Pinay” = Filipina American female, so she was really excited to meet the “Queen of Jazzipino”. She swayed and sang along through Charmaine’s 60-minute set, which included “Doodlin’ in Taglish” (half Tagalog, half English), a traditional harana (Filipino serenade), a Duke Ellington song, a cover of U2’s “With or Without You”, and so appropriate for Motown: “Feelin’ Stevie” (a tribute to Stevie Wonder). My favorite song of the night was when her musical director Abe Lagrimas (yes, Pinoy from Hawai’i) broke out the ukulele with Charmaine singing the classic Tagalog love ballad “Minamahal Kita”. Even if you are not fluent in Filipino, you should learn that title, which means: “I love you very much”. I surprised my American-born-self by being able to translate most of the Filipino verses for our daughter and our non-Filipino sistahfriend Deborah, who joined us for “Girls Night Out”. The Dirty Dog Jazz Café is an intimate, classy restaurant, with white linens and candle lanterns adorning each table. (Being from Seattle and the daughter of an Alaskera [salmon cannery worker], I am pretty picky about my salmon: theirs didn’t need the seafood velouté sauce, but it was pan-grilled perfect, and their bread pudding with cherry port reduction was divine.) It was fun for our daughter to get gussied up and practice her table manners, since she has taken a liking to reading all of the Fancy Nancy books (about a young girl who loves all that is French and fancy). As we do for all entertainment outings, I prepped her for the show by letting her watch some of Charmaine’s videos that are on her website and YouTube. Her favorite videos are “My Funny Brown Pinay“ (a spoof on “My Funny Valentine” with a good message to be proud of our brown skin and flat noses. “Hey, I have a flat nose too!” she said) and Charmaine’s latest video “Flow” (about the need for potable water and how it affects women). In “Flow”, our daughter loves seeing other children singing along in the studio clips. During the live show last night, she said, “I don’t think all of those kids will be performing with her like on the computer.” And then later, “Are YOU going to perform a poem, Mom? I could sing my songs from my recital.” I shook my head and wondered if other performance poets who are also parents get similar questions from their precocious kids. 🙂 Now, I’m not recommending that every parent take their little kid to a jazz club, but hey, it’s not every day that a little Asian American girl is able to see talented role models who look like her, especially in Detroit/Grosse Pointe, where Asians make up far less than 2% of the population. After the show, we bought CDs and a cute “Funny Brown Pinay” tote bag. The 5 ½ year old greeted Charmaine with a hug and the traditional “mano po” blessing of the hand; she was so happy to meet her and get her autograph. During our conversation, we realized we have many mutual friends in Los Angeles (Pinay extraordinaire Prosy de la Cruz is the one who connected us prior to the show). 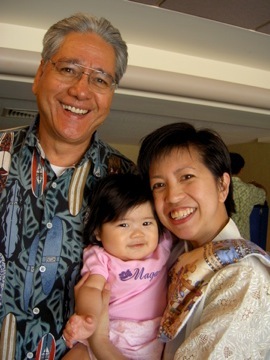 I was really surprised to discover that Charmaine attended California State University Northridge the same years that I taught there – and she said she minored in Asian American Studies (my home department)! Do any of you CSUN FASA alumni remember her from back then? Of course, she said she was in PCN (Pilipino Cultural Night), but I forgot to ask her if she sang in it, because how could I have forgotten her voice if she did? Braving the rainstorms on a school night, we went to the early show so I could get the kindergartener back home in time for bed, even though I wanted to stay for the next set. I highly recommend everyone go see Charmaine Clamor while she is in town; it is a rare treat to have a Filipina artist – all the way from Los Angeles — perform in Michigan! Emily P. Lawsin is a poet, lecturer, and co-author of Filipino Women in Detroit: 1945-1955. Last weekend, we took our kindergartner to see the Mosaic Youth Theatre of Detroit’s production of Northern Lights 1966: The Powerful True Story of Detroit Students Who Stood Up For Their Rights and Won and she loved it; we all loved it. It is the moving inspiration that we need, in a time when all levels of education in Detroit and throughout Michigan are in a crisis. Anyone who believes in people power and values education should see this play! This weekend is the last chance to see it. There is a special student matinee on May 19, half priced tickets on May 20, and closing performances on May 21-22, 2011, all at the Detroit Film Theatre inside the DIA (Detroit Institute of Arts). Northern High School was an historic school in Detroit, with many famous alumni, including Aretha Franklin, Betty Shabazz, and Smokey Robinson. It is where the Motown singing group later called “The Miracles” was founded. The day we went to see the Northern Lights 1966 play, Rick Sperling, Founder and CEO of Mosaic, introduced some Northern High School alumni who were in attendance. One who stood up was Karl Gregory, a Wayne State University Professor who, we find out later in the play, helped the students. In April 1966, more than 1000 students at Northern went on strike to protest inequities and unfair treatment at the school. During their walk-out, they decided to start their own Freedom School and asked Dr. Gregory to become the Principal; he managed to get other university professors to be teachers during the 2.5 week strike. It was cool to see the audience reaction to the dozens of actors who were portraying people that they knew. I won’t spoil the ending for you, because you really need to see this play. Stephen is also on the Board of the Boggs Center and just published the book Pages From a Black Radical’s Notebook: A James Boggs Reader. Reading that book, alongside The Next American Revolution: Sustainable Activism for the Twenty-First Century by Grace Lee Boggs with Scott Kurashige, and seeing the play Northern Lights 1966 should give you plenty of inspiration to accomplish anything: even, and especially in Detroit. Emily P. Lawsin is a spoken word performance poet and the co-author of Filipino Women in Detroit: 1945-1955. She teaches Asian/Pacific Islander American Studies in the Program in American Culture and Department of Women’s Studies at the University of Michigan. 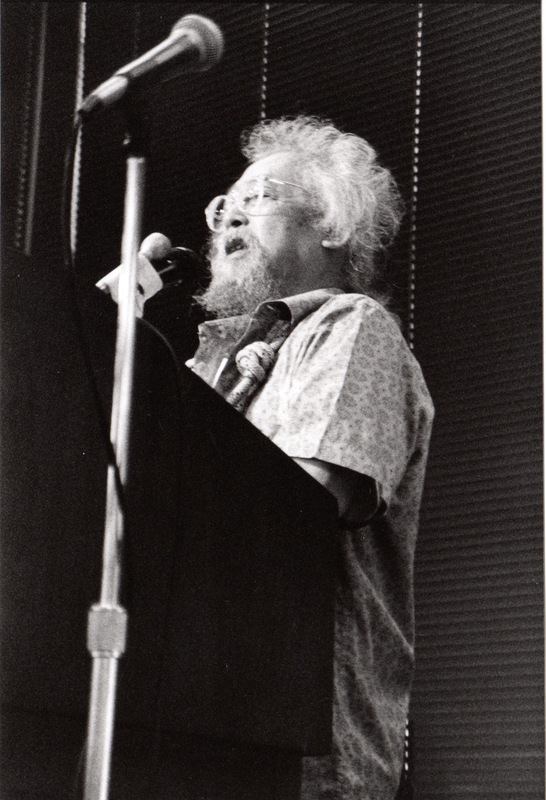 Al Robles at UCLA 1996. Photo by Tony Osumi. Today is the two-year death anniversary of the incredible poet Al Robles (February 16, 1930 – May 2, 2009). Manong Al and many of our ancestors who have gone before us have largely influenced my poetry and oral history work. As the people’s recorder and founding member of the Kearny Street Writers Workshop, Manong Al was like a ninong (godfather) to all of us Filipina/o Americans who are spoken word performance poets, oral historians, cultural artists, and/or activists. When I was just a teen, I was blessed to have been able to read his poetry and to learn about how he fought to save the International Hotel in San Francisco’s Manilatown, through my elder cousin, his good friend and fellow Kearny Street poet, Oscar Peñaranda. Many years later, when I was in graduate school and when I started teaching Filipino American Studies, I would see Manong Al at various conferences and community events. He would always give me a hug or slap on the back and say, “Hey sistah, what’s shakin’?” Then a crowd would gather in a circle around him while he cracked jokes or played piano, talking story late into the night. L.A. Poets with Jessica Hagedorn & Al Robles at Pilipino Studies Symposium at UCLA, 1997. Photo by Carlo Medina CDM Foto. 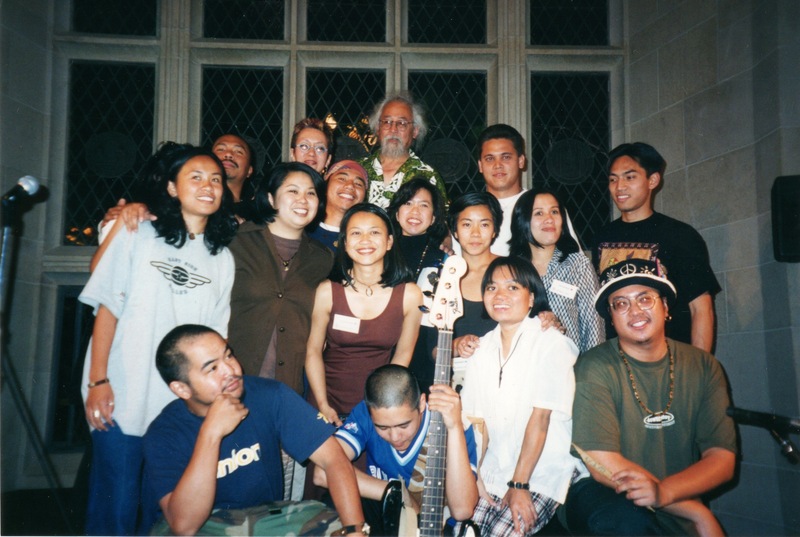 Throughout the 1990s, long before “Poetry Slam” competitions became popular, we had Filipino American spoken word poetry and open mic nights all over Los Angeles (and beyond), often organized by Wendell Pascual, Irene Suico Soriano, or the Balagtasan Collective. Following in Manong Al’s footsteps, we knew we couldn’t just study how Filipinos came from an oral tradition, we embraced it and embodied it. 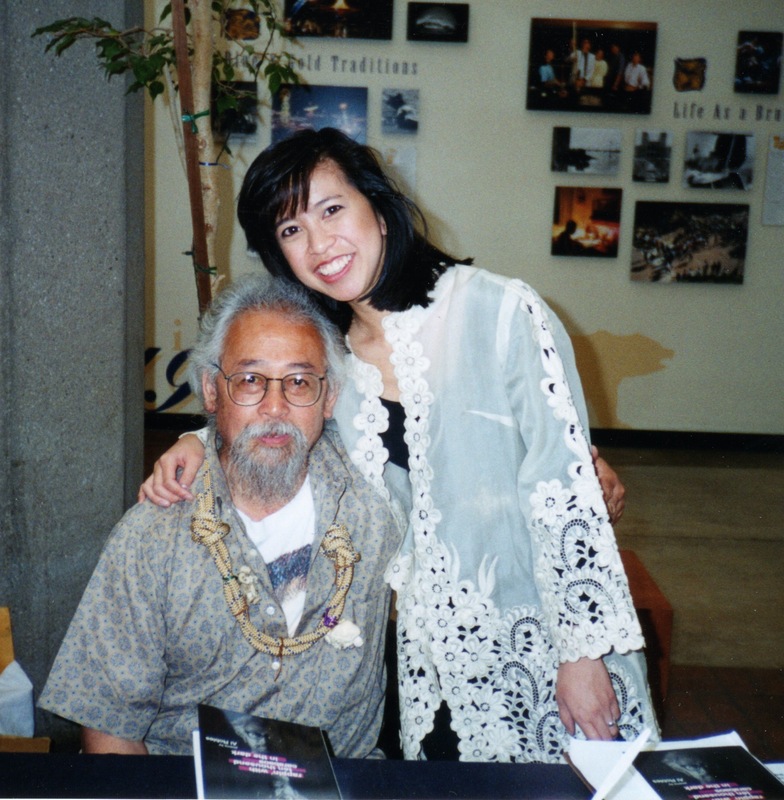 In 1996, when my alma mater UCLA’s Asian American Studies Center Press published Manong Al’s book of poetry, many of us poets were ecstatic and honored to be able to perform with and for the legendary Al Robles. During the 90-minute drive from West L.A. to one book launch that Theo Gonzalves had organized at UC Irvine, I wrote this letter to my cousin Oscar to tell him that Manong Al was in town. It turned into this poem (below). I performed it later that night and it was published several years later in disOrient Journalzine. Afterwards, Manong Al said that we have to keep writing about the streets because we have all walked down them, no matter what the city. We recognize them as Pinoys: streets like Kearny, El Dorado, Temple, and Jackson, because for generations, that’s where “cats would hang out”, talking story late into the night. The week that Manong Al passed away in 2009, I was living in Boston, and I performed a modified version of this poem at the East Meets West Bookstore in Cambridge, with the Boston Progress Arts Collective’s (BPAC) house band: Charles Kim on guitar, Nate Bae Kupel on drums, and Pedro Magni on keyboards. 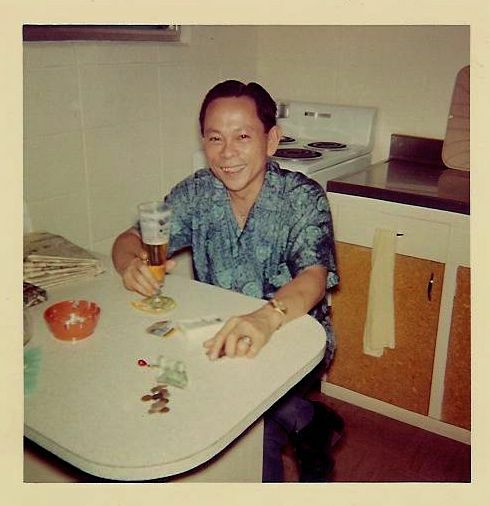 I had said that night that Manong Al would have loved that space, which hosts the country’s only year-round monthly Asian American open mic series, like Kearney Street did in the early 1970s. As a call to the ancestors, I played a little bit of kubing (Philippine mouth harp), swayed to BPAC’s jazz, then looked up at the younger generation overflowing onto Massachusetts Ave, and felt Manong Al’s warm spirit talking story with us, late into the night. I love and miss you, Manong Al. Thank you for being our voice. Rest In Poetry. Irvine, California, May 17, 1996.
how could we ever fill your shoes? are no match for Mama’s boomerang bakyas and tsinelas. we shout via E-mail, reclaiming reclámo. fading from sun stroke in your beat-up, unwaxed coche. used to push up to Seattle? Never thanked you for those days. will crush coconuts in the Ivory Tower. fry his tuyo not knowing where it came from. Robles’ rallies, and even Hagedorn’s hell-bent heresies. 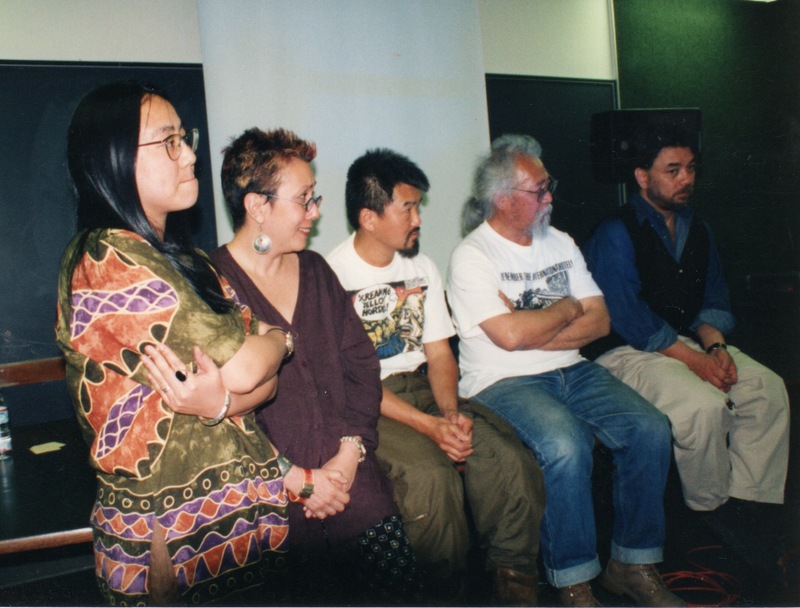 Angel Velasco Shaw, Jessica Hagedorn, Curtis Choy, Al Robles, Norman Jayo at UCLA Pilipino Studies Symposium 1997. Photo by Carlo Medina CDM Foto. Irene Soriano, Darlene Rodrigues, and Theo Gonzalves. 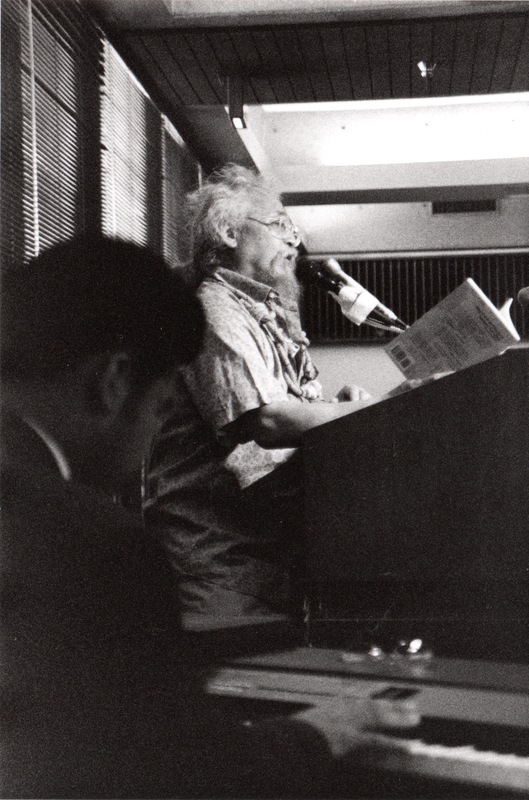 Al Robles reads poetry with Theo Gonzalves on piano at Royal Morales' retirement at UCLA 1996. Photo by Tony Osumi. Performed live at UC Irvine by Emily Lawsin with Theo Gonzalves on keyboards, May 17, 1996. Originally published in DisOrient Journalzine, Volume 9: 2001.